This is difficult to even type. Max-The-Artist’s 15-month-old daughter Kiki has been diagnosed with Stage 4 cancer. She’s in a Pediatrics Oncology ward now and we’re all scared to death. This is a bad one. Chemo, radiation, stem cells, surgery; it is all happening. My wife and I are completely devastated. Naturally, we will be helping in every way we can. Max and I are not stopping the comic but we do have to put it on hold for an extended period of time while Kiki’s treatment is going on. 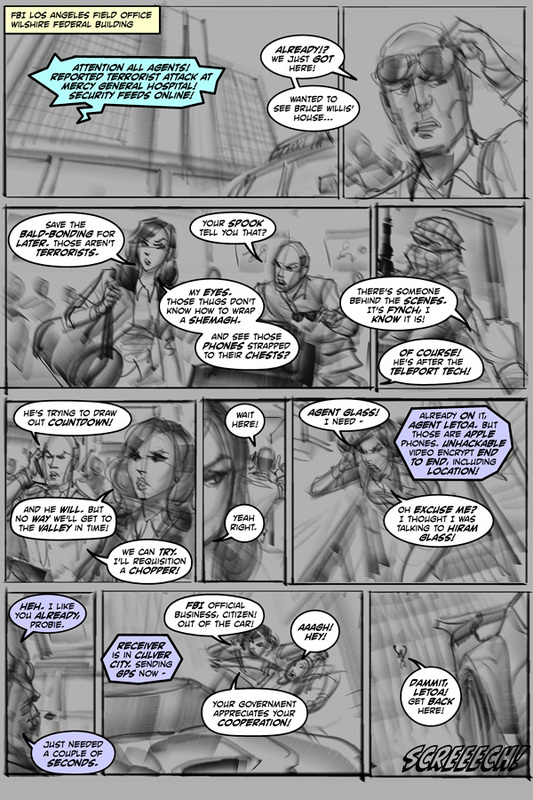 I’ve posted a rough of the comic page that was in progress when this calamity suddenly disrupted our lives, and we want to thank everyone who has been following the story. It is our fervent hope that 3MM will be able to continue once we adjust to whatever our lives become during treatment and beyond. If you can spare us some good thoughts, we’d be grateful, but we especially want to thank YOU for being there for us all this time. And again, our thanks for being part of our “extended family” thus far. We truly appreciate your understanding in this matter. UPDATE: Stem cell therapy underway. You can follow Kiki’s progress by going to the GFM page and clicking on “Updates” for the latest news (I can’t seem to find a way to link it directly.) Thank you for your thoughts and support during all this. I’m truly sorry to hear that. I hope neither of you will feel at all bad for taking all of the time you need. I wish her a smooth journey. Not to be rough about this, but why are you wasting time reading my comment? Yeah, I’m a grandfather too. WHAT!!! Omg, I’m so sorry. Take all the time you need, we’ll be here. Loving hopes & prayers for Kiki. Hopes & positive thoughts in these trying times, Max can wait the really important updates should be KiKi’s progress. I wish her a much speedy recovery. Take ALL the time in the world you all need. As much as I want to see this comic continue I’m MORE worried about Kiki’s health now. Best of luck to you all. Praying for Kiki and the entire family! So sorry to hear that. Cancer is a blight no little kiddo should ever have to endure. And no parent should have to watch their kiddo go through it. Pulling for Kiki and all ya’ll. I…don’t know what to say. I wish I could say something that would make it all better. Or even a little. All I can say is I’m here for you, and my next click after ‘Post Comment’ is the gofundme link. I hope for the best for that dear little girl. As a parent, my heart is breaking for you. Love and support. Good luck and I’m hoping and Praying for the best outcome. I can’t imagine what your family is going through. My best wishes to you and yours in these terrible circumstances. I’m thinking the only reason for max to be working on the comic at this time is to help calm himself from the worries caused by this terrible illness. Comic updates can wait, but health/treatment updates will be welcome. Thanks for all you guys have given us these many months. Take care of yourselves and Kiki. I second all of this! Poor little one. She looks frightened. Good thoughts sent. My wife just lost her dad very suddenly to cancer. I pray that Kiki recovers fully and lives a long and healthy life! You are in my prayers folks. You have my eternal wishes for strength and courage. I know what it’s like for someone close for you to get sick. My brother was diagnosed with the same thing at 5 years old. He’s now in his 20s and attending college. It is beatable. I know you’re probably inundated with people offering different solutions, but please send me an email (I don’t care if it’s from a burner, so long as you can access it) so I can respond with personal details about us and what we did to help him. I know it will help her. Praying for you all. You will get through this. Please keep us updated!! I have to take a minute to say thank you all for the support and also I’m deeply touched by the generous donations of our readers and the webcomic community at large. To everyone: Hug your kids and donate blood. That you managed to update to even tell us that is amazing and appreciated. It’s awful. My hope for you is that the amazing progress we have made in the last couple decades is enough to make the difference. May you get the support you need and may you find the strength. All the best to Kiki and to you all. Courage. I know from personal experience how frightening (and annoying) the words “Stage Four” are. I am living proof that those odds can be beaten. My prayers have gone out for the little one, for her parents, and for her grandparents. Please let me know if I can be of any help in understanding what the little one is going through. Another grandparent here. Praying for your entire family. I have a dear friend who’s dealing with her own “stage 4” and her grace under pressure is truly inspirational. Take all the time you need; family comes first and a child’s needs before everything else. I am going through all of that myself, but I can’t imagine what it’s like to have a precious Little One going through it! My prayers are with you, all of you. Love and respect, we will all be here when things are better for you! This is not the way to research hospital settings. I’ll add our prayers. We too went through something similar. If one must have cancer, especially pediatric cancer, this is still the country to do so in. I’m so sorry to hear this. Good thoughts on the way, and best wishes to everyone. Oh my goodness! That’s horrible to hear! While I don’t have any money I can offer I can at the very least offer my prayers. May I ask how kiki is doing it’s been 2 months with barely a word about it. My hope and thoughts are with her and have been for a while. Thank you for your thoughts. 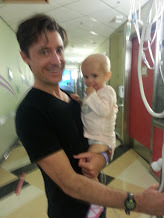 I’ve posted an update showing Max and Kiki during the most recent chemo cycle. Glad to know things are progressing at least semi-positively, especially after the twin losses of Aretha and McCain to this same disease. Tell Kiki we’re still pulling for her. So, as November winds down, how is Kiki doing? Having a bit of a rough time right now. The stem cell therapy is very hard and on top of it she developed sepsis. But she is hanging in there. Good thoughts appreciated. Get well, Kiki! Max, be the dad she needs, and may you both find the strength! I’m sorry, I know how you feel, least semblance of it, as my mother went through chemo for stage 4 ovarian… Give Kiki lots of love, lots of prayers, and she will make it. New update, including a bear big enough to give Khalil Mack pause. Bob, Max, take all the time you need. KiKi deserves all the love her family can give. Something I’ve seen in a few corners of the Net that I thought might amuse Max for a minute. Grampa Forward PhD probably had this memorized back in the day. means you need more core. means you need more secondary allocation. means you need more primary allocation. You just need a steplib to the right library. just means the table needs to be fixed. where a bad order causes an OC4. It means a DD’s missing for someone. means your trailers aren’t going to heaven. since header and DSN are not the same. it means your really have bad input. means you must scratch data sets from MN0001. it could mean a data set’s gone, gone, gone. you might check closely with the LRECL and BLKSIZE. Since the current vote incentive is a bit stale, maybe you could replace it with one of Kiki’s artworks? A small dab of normalcy would probably be good for your collective psyche, and she’s a wonderful artist (look at her lineage 🙂 ). *after a bit of quick math and calendar checking* Hmm, seems today would be Kiki’s twelfth radiation treatment, which was the lower end of what had been discussed, and the upper end, twenty treatments, would be a week from next Tuesday, 2019.04.09. That’s if the schedule was held. Many manipulatory digits intertwined! Also, Happy (belated) Birthday, Kiki! According to the latest update, today was the last one. Up next: nine months of immunigen therapy.